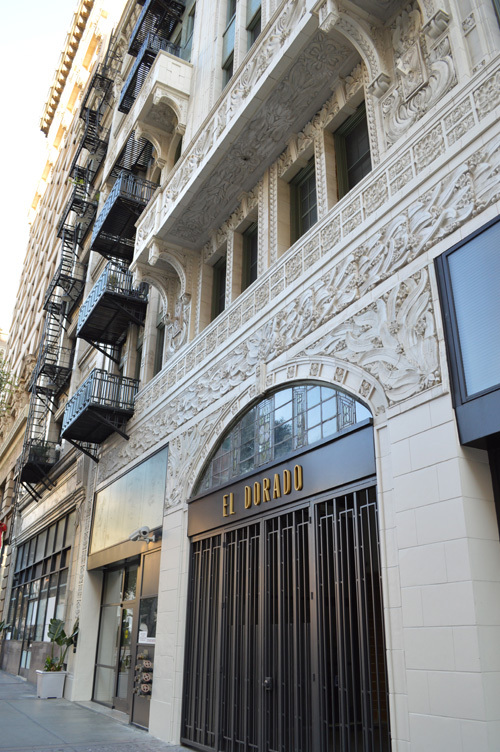 The El Dorado Lofts, constructed in 1913 was described by the LA Times as a magnificent hostelry with a strikingly beautiful façade and metropolitan conveniences. It was constructed by Downtown Properties. The exterior facade is dressed in concrete and turn of the century terracotta. Green glazed brick clad the exterior with Batchelder tiles on the interior walls and lobby columns. This building is a historical building and was once the home of Charlie Chaplin. The El Dorado lofts was built by and originally named for local capitalist and financier, N.W. Stowell. It was originally named the Hotel Stowell and was sold in 1938 and later renamed the El Dorado Hotel. The condos are open and airy and they offer great versatility with both the loft style and enclosed bedrooms. They also offer balconies or landings in some condos to enjoy the cityscape views. There are six residences on each of the ten floors. The lofts range from 848 square feet to 1,394 square feet. Authentic 1898 solid wood doors introduce each home and fire escape style, wrought iron landings and balconies showcase many of the residences. Also, there are state of the art kitchens and space for stacked washers and dryers making life easier for residents. When you live in this historic building, you are close to the Financial District or Civic Center or go to the Disney Concert Hall ® , Little Tokyo, the Dorothy Concert Hall ® , Dorothy Chandler Pavilion ® , Mark Taper Forum ® or the Museum of Contemporary Art ® . The El Dorado is magnificent and offers an open and airy design with great versatility to live in.